The most anticipated event of the Spring every year for Knights has arrived. 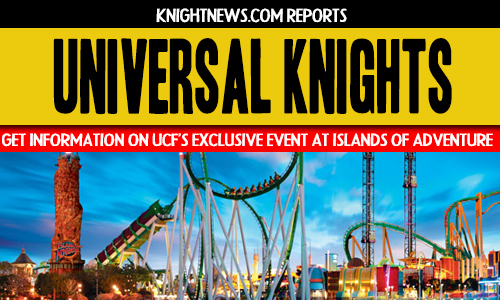 Universal Knights at Universal Orlando’s Islands of Adventure will offer UCF students free admission to the thrill park for an entire night. Year after year students line up to ticket booths on campus to take advantage of their university’s partnership with world-class theme parks. One ticket per student. You must be present with your ID to obtain your ticket. A friend may not pick it up for you. If you were given a “Beat the Lines Pass” this year at SGA events, please continue to check the email you provided periodically, as your ticket distribution date will be communicated to you directly. Beat the Lines passes are not park fast passes but instead allow you to obtain your ticket from SGA quicker than a normal distribution. Graduate Students will have their own distribution dates this year. More information will be communicated with you soon. Tickets are distributed amongst all UCF campuses proportionally based on student enrollment population. Regional campuses, we are in communication with your campuses and will post your ticket distribution dates and times as soon as we have them! You can only buy a guest ticket the day of the event, at the park itself from 4pm-8pm. You must present your Student ID to get a guest ticket for the event. One guest ticket per student ID. There will be free complimentary parking to those who print out a parking pass. Once we receive the pass from Universal, we will update everyone and post the image on the SGA website! SGA will be providing bus transportation free of cost to students. More info coming soon!